The Circuit of the Americas in Austin, Texas, hosts Formula One, MotoGP, World Endurance Championship events, and well just about anything on wheels. Recently Chrysler’s Ram truck division used it for something a little more red neck. 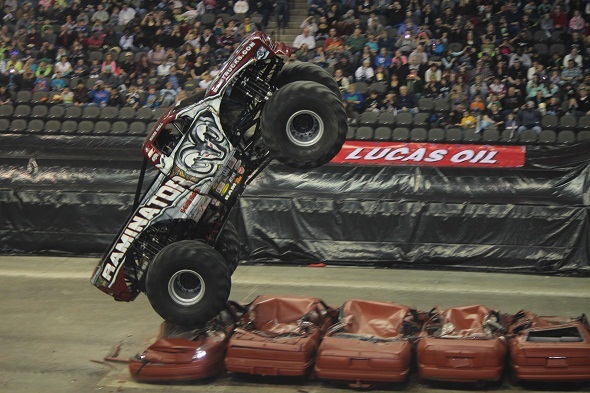 The Ram-sponsored Raminator became the world’s fastest monster truck, hitting 99.1 mph in a run down the course’s main straight. Naturally, a representative from the Guinness Book of World Records was on hand to confirm the achievement. Run by the Hall Brothers Racing Team out of Champaign, Illinois, the Raminator beat the previous record of 96.8 mph with driver Mark Hall at the wheel. Hall said he had hoped to crack 100 mph, but was still happy to take home the record. It may not seem especially fast for a racing vehicle, but the speed achieved is pretty impressive for a truck that weighs 10,300 pounds, and designed to spend a not-insignificant amount of time airborne or crushing smaller vehicles. Like all monster trucks the Raminator is not lacking in power. The tube-chassis truck is power by a supercharged 565-cubic-inch HEMI V-8, which produces around 2,000 horsepower. Hall Brothers said no modifications were made for the record attempt. Monster trucks continue to be an important marketing tool for auto makers. Because who doesn’t want to see an amped-up version of their truck pulling stunts and breaking speed records? ← Project Hard Rock Name Change!